When our senior students navigate the raging rapids of the Madawaska River or paddle their way through British Columbia’s Kyuquot Sound, they’re relying on skills - and elements of character - they’ve been developing since Grade 7 or Grade 9. Twice a year, at start of term, the grades spend a week together off-campus. These fall and winter Outdoor Education experiences - which become more challenging as students progress through the school - encourage them to find new depths of perseverance, to take risks and to adapt to their changing environment. Along the way, they learn the value of teamwork and establish enduring friendships. 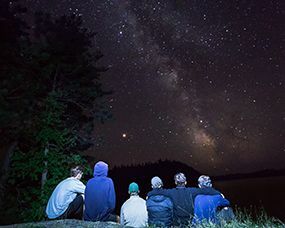 In Grade 12, the focus of the Fall Outdoor Education experience turns to leadership. Students have the option to act as mentors for younger students at Kilcoo Camp or Camp Tamakwa, or to earn their whitewater and wilderness first aid certifications at the Madawaska Kanu Centre. Outdoor Education experiences become progressively more challenging as students move through the school.